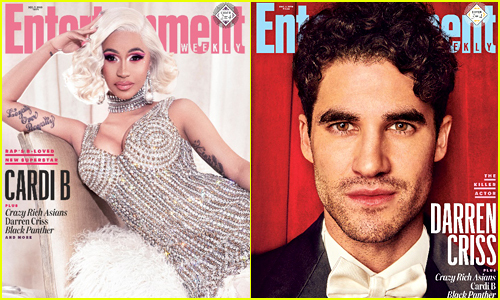 EW's Entertainers of the Year: Cardi B, Darren Criss, the Women of 'Black Panther' & 'Crazy Rich Asians,' & More! 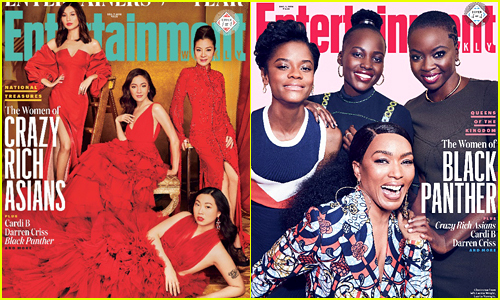 Entertainment Weekly has named their entertainers of the year and has unveiled four new covers featuring Cardi B, Darren Criss, the women of Black Panther and the women of Crazy Rich Asians! The four women of Crazy Rich Asians – Constance Wu, Awkwafina, Michelle Yeoh, and Gemma Chan – were recognized for their amazing work in the global hit. Cardi B is being recognized for her double platinum album Invasion of Privacy, her numerous hot singles, and more. Darren is being recognized for his stellar work on The Assassination of Gianni Versace: American Crime Story. The women of Black Panther – Angela Bassett, Danai Gurira, Lupita Nyong’o, and Letitia Wright – are being recognized for their amazing work in the smash hit. The issue is on newsstands nationwide November 30. Check out more on EW now. Lupita Nyong’o, John Krasinski and Rosamund Pike strike a pose backstage at day two of Variety’s 2018 Actors on Actors Awards Studio on Sunday (November 18) at Goya Studios in Los Angeles. The three stars were joined at the event by Green Book‘s Mahershala Ali and Viggo Mortensen, BlacKkKlansman‘s John David Washington, Melissa McCarthy, The Wife‘s Glenn Close, A Star is Born‘s Sam Elliott, Black Panther‘s Chadwick Boseman, If Beale Street Could Talk‘s Regina King, and The Kindergarten Teacher‘s Maggie Gyllenhaal. The Star Wars: Episode IX cast has been revealed! Producers announced the cast for the movie, which will begin filming at London’s Pinewood Studios on August 1, on Friday (July 27). J.J. Abrams will direct the final installment of the Skywalker Saga, and co-wrote the movie with Chris Terrio. Returning cast members include Daisy Ridley, Adam Driver, John Boyega, Oscar Isaac, Lupita Nyong’o, Domhnall Gleeson, Kelly Marie Tran, Joonas Suotamo and Billie Lourd. Newcomers to the cast are Naomi Ackie and Richard E. Grant. Veteran stars Mark Hamill, Anthony Daniels and Billy Dee Williams will return. Carrie Fisher will once again play Leia Organa using previously unreleased footage shot for Star Wars: The Force Awakens. “We desperately loved Carrie Fisher. Finding a truly satisfying conclusion to the Skywalker saga without her eluded us. We were never going to recast, or use a CG character. 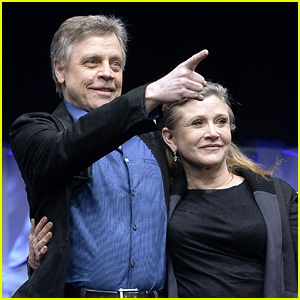 With the support and blessing from her daughter, Billie, we have found a way to honor Carrie’s legacy and role as Leia in Episode IX by using unseen footage we shot together in Episode VII,” J.J. said. Composer John Williams will return to soundtrack Episode IX. The movie is set to hit theaters in December 2019. Jessica Chastain to Star in Female Driven Spy Thriller with Lupita Nyong'o, Penelope Cruz & More! This is one amazing cast! Jessica Chastain is teaming up with Marion Cotillard, Penelope Cruz, Fan Bingbing and Lupita Nyong’o for a spy thriller movie titles 355, described as a “large scale espionage film,” Deadline reports. All the women will play international spies in the movie, which is described to be in the style of other films like The Bourne Identity, Mission: Impossible and James Bond. Theresa Rebeck will write the script with Simon Kinberg set to direct. The hope is that the movie will become a franchise. 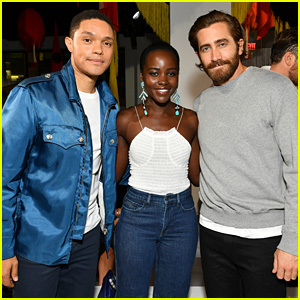 Jake Gyllenhaal & Lupita Nyong'o Hang with Trevor Noah at Calvin Klein's NYFW Show! Trevor Noah, Lupita Nyong’o, and Jake Gyllenhaal pose for a photo while attending the Calvin Klein Collection show held during New York Fashion Week on Thursday (September 7) in New York City. The three stars were seen chatting it up before the show began and some other stars in attendance included Rashida Jones, Christina Ricci, and Vogue‘s Anna Wintour and Grace Coddington. Lupita was positively glowing while she met up with Anna and Grace. She has been featured on the cover of Vogue twice in the past! Amy Adams keeps it simple in a chic black dress while attending the 2016 Elle Women In Hollywood Awards held at the Four Seasons Hotel on Monday (October 24) in Beverly Hills, Calif. The 42-year-old actress was joined on the red carpet by Lupita Nyong’o and Helen Mirren, who were all being honored at the event. Other attendees at the award ceremony included Constance Zimmer, Shiri Appleby, Niecy Nash, Kathy Bates, January Jones, Darby Stanchfield, Regina King and Michelle Monaghan. The Elle Women in Hollywood Awards honor eight female celebs who have made achievements for women in film, each featured on their own magazine cover. FYI: Amy is wearing a Lanvin dress. Lupita is wearing a Duro Olowu gown. Helen is wearing a Victoria Beckham dress. Shiri is wearing a La Mania jumpsuit. Regina is wearing a Christian Siriano dress. Michelle is wearing a Prabal Gurung gown.